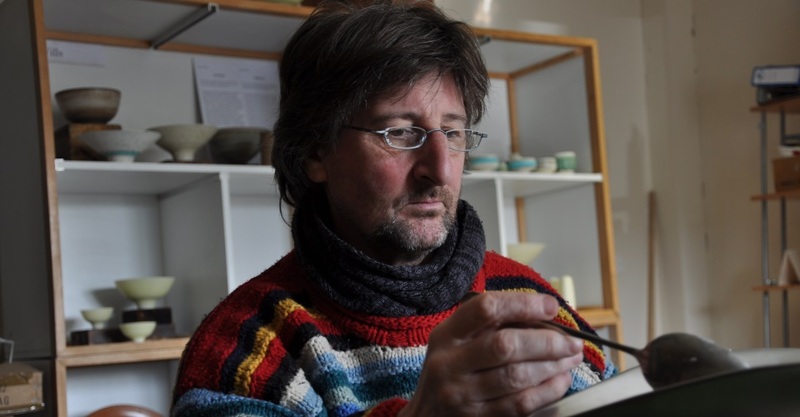 The work of Peter Wills, a professional potter since 1989, has been evolving over the years within the context of attention to detail, balanced form/decoration, and passion – all of which he believes are crucial. Of his numerous influences, Bernard Leach’s “A Potter’s Book”, and the whole ethos behind that work, was one of the first and strongest. Sung and Tang Dynasty Chinese pots have also been an inspiration, along with major 20th-century European potters such as Lucie Rie, Hans Coper and Michael Cardew. Profound and lasting early influences came from the artist-potter and early CPA member Derek Davis; and also tutor Sue Nichols. Widely exhibited in Britain, his work has also been shown in Italy, Brussels, Spain, the Netherlands, Japan, the UAE, Germany, and the USA. Commissions undertaken have included those from his local Council and The Princess of Wales Hospital, Bridgend. In the spring of 1998 he gained his most prestigious commission to date when asked by HM Government to make bowls for them to present as gifts to the nineteen visiting European Heads of State attending a Summit in Cardiff. His work has been featured in many national publications including: World of Interiors; Homes & Antiques; The Daily Mail “Weekend” magazine; and The Times. His pots have travelled far and wide and can be found in public and private collections in Britain and around the world.